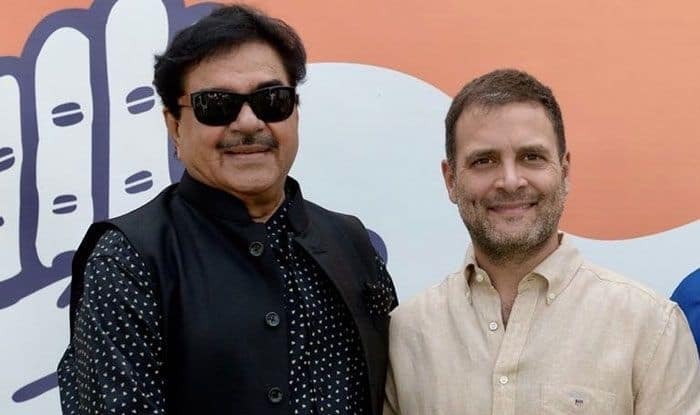 Actor-turned-politician Shatrughan Sinha on Monday slammed the BJP for mocking Rahul Gandhi's decision to contest the Lok Sabha elections 2019 from two constituencies. New Delhi: A day after actor-turned-politician Shatrughan Sinha announced that he is quitting the BJP to join the Congress party, ‘shotgun’ on Monday threw weight behind Rahul Gandhi’s decision to contest the Lok Sabha elections from two seats- Wayanad in Kerala and Amethi in Uttar Pradesh. When reports emerged that Congress leaders from Karnataka, Kerala and Tamil Nadu were urging Rahul Gandhi to fight from a constituency in their state, Irani insinuated that since people of Amethi have rejected Gandhi, he was looking at filing his nomination from somewhere else. Now, Shatrughan Sinha has come out batting for Rahul Gandhi asking the BJP leadership to look back and answer how can they question Gandhi’s decision when Prime Minister Narendra Modi also contested from Varanasi and Vadodara constituencies in 2014 General elections. Sinha will be joining the Congress on April 6. His decision was finalised after a meeting with Rahul Gandhi in New Delhi last week.